No it's not Cinco de Mayo, it's Mexico's Independence Day on September 16, 2010. In fact, this year marks the 200th anniversary of Mexico's independence from Spain! With Costa Rica, El Salvador, Guatemala, Honduras, and Nicaragua celebrating their independence on September 15, combined with September being Latino Heritage month - you're pretty much guaranteed fiestas all week long! Bartender Johnny arrives with his hat and tache! The Penelope crew and I went to a margarita tasting at Tres Agaves restaurant in San Francisco featuring El Jimador Añejo, El Tesoro Platinum, and Casa Noble tequilas. 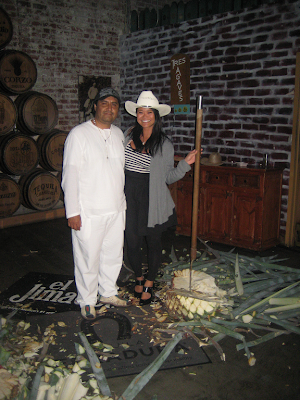 To end the evening, a Jimador showed us how he uses the "coa de jima", a flat-bladed knife at the end of a long pole, to remove the flower from the blue agave plant, which is used for tequila production. Long Live the Heroes that gave us our Fatherland! Long Live the Independence Bicentennial! 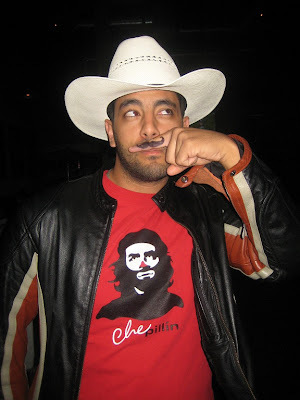 Long Love the Centennial of the Revolution!